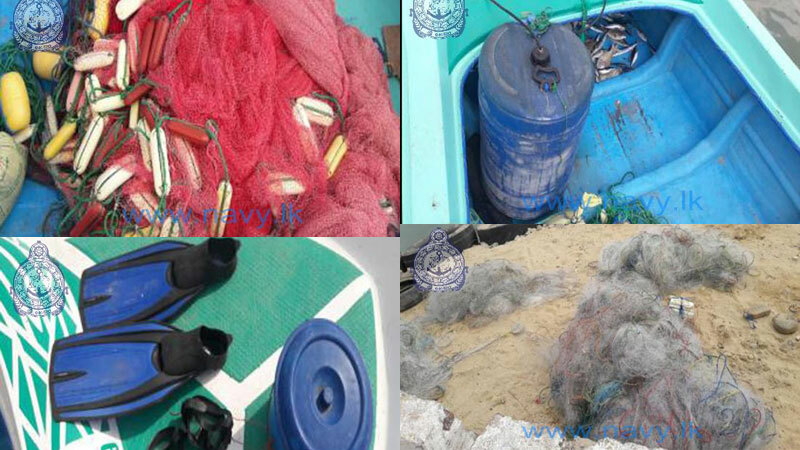 A group of naval personnel attached to the Northwestern Naval Command, during patrol in the sea area of Palliyawatta in Kalpitiya, arrested 03 persons for engaging in illegal fishing using unauthorized nets, without a valid license. The arrested persons have been identified as residents of Kalpitiya area. The naval personnel had also seized a dinghy, 100m long unauthorized fishing net, an outboard motor and 10kg of illegally caught fish, during the arrest. Further, naval personnel attached to the same naval command had also found 20 pieces of illegal fishing nets during a patrol carried out in Rodapadu sea area. The arrested persons along with the dinghy, fish, unauthorized fishing nets and other fishing gear were handed over to the Fisheries Inspector of Puttalam for onward action.